Western Australian grower, Peter Wheeldon, has used his new Flexi-Coil 5500 air drill in combination with a 4350 tow between, triple bin air cart to sow his Yuna property this season and has been very impressed with the results. He used this air drill and tow between combination to sow 3,500 hectares of wheat, 800 hectares of lupins and 700 hectares of canola and on his family’s 5,000-hectare property, north east of Geraldton. 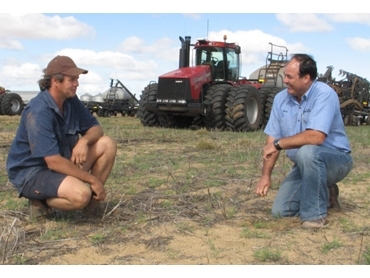 Peter and his parents run 4 farming properties and this was the first year that they implemented the new Flexi-Coil air drill set up for seeding. Peter explained that one of the advantages was that it coped well with the variable soil conditions and high levels of weed residue on their properties. The Flexi-Coil air drills are available in widths of 60 or 70 feet and feature a patented two-piece wing, with simple, parallel-circuit hydraulics. This design ensures accuracy of depth as well as minimimal stress to the framework. The outstanding land following flexibility provides precise seed placement. Each wing is attached to a collective allowing each wing/press wheel combination to follow the ground. Peter describes the combination of air drill and high capacity three bin air cart as easy to use and as a real time saver as it only requires one person to operate rather than two. With the three bin set up there is no need to canola seed in with the fertilizer; one bin can be allocated to seed, one to DAP and one to urea. The Flexi-Coil air carts, air drills and other innovations are designed to easily accommodate a variety of cropping activities or large air seeders. Product can be divided into equal sections, with air and product being mixed in a parallel flow for a smooth transition from meter box to distribution system. The Wheeldons set their 70’ air drill with 12” spacings, 4” press wheels and 350lb trips. They carry out skiprow sowing in order to minimise the turning stress on the machine.